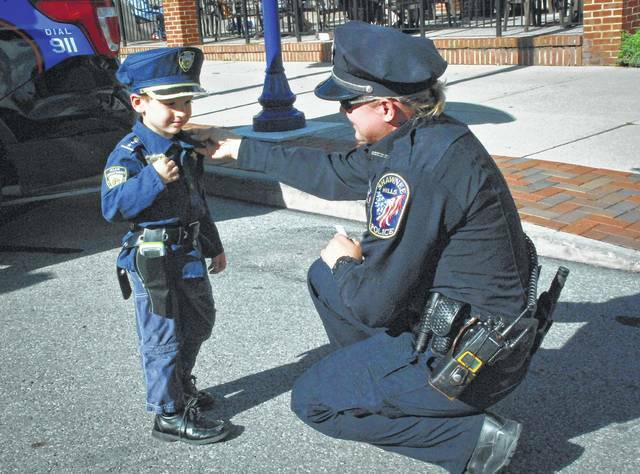 In this Delaware Gazette file photo, Shawnee Hills Police Officer LC Goetz double checks Tanner Kongo’s attire to make sure all is according to uniform codes before Delaware’s First Friday Picnic with a Cop event last year. Kongo looked at every piece of police equipment and shook the hand of every police officer at the Friday evening event. Kongo said when he grows up, he wants to be the chief of police just like his friend Delaware City Police Chief Bruce Pijanowski. With calendars about to turn to August, Main Street Delaware is preparing for its next First Friday event to be held on Aug. 3. This month’s theme will be a celebration of Delaware’s law enforcement with a night of “Cops and Shops,” sponsored by Performance Chrysler Jeep Dodge Ram of Delaware, Breakaway Cycling, Delaware General Health District, and the local Foot & Ankle Wellness Center. Festivities will include a classic police car cruise-in. From 6 to 9 p.m., the Delaware Police Department and Delaware County Sheriff’s Office will have cruisers on site for children to explore. A children’s fingerprinting station will also be set up as part of a safety promotion initiative. Local officers will serve up free hot dogs, while supplies last, to all who come out to enjoy the downtown celebration. Patrons are encouraged to ride their bikes to the event. A bike corral will be located at the corner of Central Avenue and Sandusky Street to ensure all bikes are kept safe while eventgoers enjoy the evening. Those who check their bike in at the corral will receive a coupon for a free ice cream. To let local law enforcement know how much they are appreciated, many shops and businesses downtown will provide posters that citizens may write thank you messages on. “It is important for us to have a First Friday themed around law enforcement, because we want to recognize our officers for everything they do for our city and the impact they have on the community in Delaware,” said Caroline Pusateri, the office assistant at Main Street Delaware. As always, shops and restaurants will have extended hours to accommodate the event, and Sandusky Street will be closed between William Street and Central Avenue. For questions or additional information, contact Main Street Delaware Executive Director Susie Bibler at 740-362-6050 or by email at director@mainstreetdelaware.com.